Summary: A girls game that involves creating a unique outfit using unusual items. 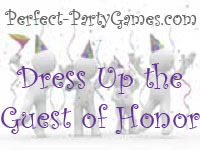 If being played at a Bridal Shower, use the Bride and some Bridemaids as the models and have a team competition. Have the Guest of Honor stand in the middle of the other players. The players get to then start making an outfit on the Guest of Honor with the toilet paper. The more creative the better! 1) You could also use plastic wrap and/or aluminum foil as well as the toilet paper. Check out this video of some pretty fabulous wedding dresses made from just toilet paper!